Do you find your mind wandering while praying the Rosary? Or would you like to able to meditate better on its wonderful mysteries concerning the lives of Our Lord and His Blessed Mother? This book is a must have in either case! 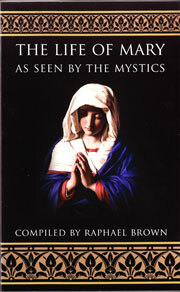 Complier Raphael Brown has taken the private revelations from four renowned Catholic mystics, Ven. Anne Catherine Emmerich, Ven. Mary of Agreda, St. Bridget of Sweden and St. Elizabeth of Schoenau concerning Mary’s life and woven them into a rich, highly readable tapestry of insights about her and her Son.